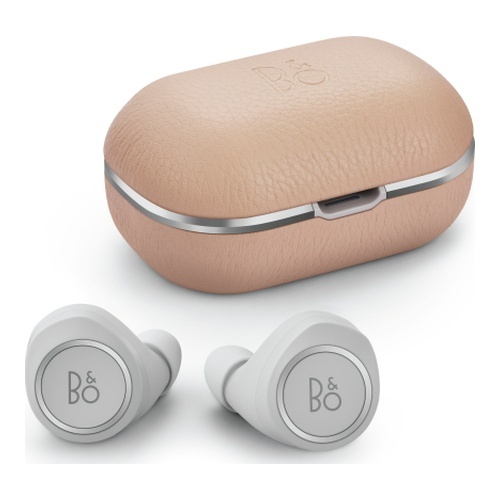 Beoplay E8 2.0 are fitted with wireless charging (Qi), making the product truly and totally wireless. E8 2.0 combine a subtle and elegant design you can grab and go with all the convenience of no wires. Qi wireless devices need only to be set down on a Qi wireless charger for recharging to occur. The device remains unplugged and ready to be picked up and used at any moment. The wireless charging pad will be sold separately. Tuned by acclaimed Bang & Olufsen sound engineers for an authentic, powerful sound experience, E8 2.0 are effortlessly high-tech and deliver wireless Bang & Olufsen Signature Sound that will leave your ears wanting more. E8 has up to 16 hours* of playtime with easy recharging on the go - a truly wireless portable solution. E8 2.0’s leather carrying case has been designed so you can take E8 2.0 with you everywhere and charge them on the go. The case features wireless charging (Qi), USB-C and holds three full charges. The earphones fit perfectly into the case where they are surrounded by a beautiful inlay of brushed anodized aluminium. With a secure magnetic click, they stay in place and will recharge with up to 16 hours of playtime*. Cord free, truly wireless earphones with wireless charging case, Bang & Olufsen Signature Sound and an intuitive touch interface that gives you control over music, calls and voice commands. Designed to fit snugly and comfortably in your ear, the E8 2.0 earphones come in a premium, leather wireless charging case so you can recharge them on the go.